Hard-line supporters of the VMRO DPMNE party that ran Macedonia for 11 years say they are outraged that the party has broken its promise not to allow the opposition take power. Read more. After Bosnian Serb soldier Nikola Barisic stepped on a landmine, his life was saved by ‘enemy’ troops and medics - and he has now returned to donate thousands of euros to their hospital in gratitude. Read more. Meet the Afghan refugee civil engineer who discovered his artistic talent after fleeing to Serbia. Read more. A referendum on the secession of the Bosnian Serb entity of Republika Sprska from the rest of Bosnia and Herzegovina will be held when the conditions are created, the president of the entity, Milorad Dodik, told journalists on Sunday. “Whether this will happen in 2018 or 2028 it does not matter from the standpoint of national and state interests,” Dodik said, adding that in the last 20 years there has not been a single a project that was in interests of Republika Srpska. Thousands of people attended a protest rally in Moldova’s capital, Chisinau, on Sunday organised by the opposition against the proposed vote to change the electoral system to a plurality or winner-takes-all model, advanced by the ruling Democratic Party. The protest comes a day after the European Parliament Budget Rapporteur, Siegfried Muresan, told Radio Free Europe that the EU is mulling blocking the 100 million euros of aid for Moldova if the ruling party continues with its plan to change the electoral system without the backing of the opposition. Romania’s third largest political force, Save Romania Union, USR, re-elected Nicusor Dan as party chief on the weekend, despite accusations of authoritarian leadership. Dan announced a shadow government to scrutinize the Social Democrat cabinet, indicating that it might even be led by former PM Dacian Ciolos, who recently expressed intent to join the USR. Romania’s national Liberal Party, PNL, the main opposition force, kicked off its preparations on Monday for the June 17 party congress, with two candidates - former Transport Minister Ludovic Orban and MP Cristian Busoi – filing their candidacy for party leadership. Croatian website Antifasisticki Vijesnik published a photo of Serbian historian Bojan Dimitrijevic, who supports the rehabilitation of Nazi collaborators Draza Mihajlovic and Milan Nedic, sporting a shirt with a Nazi symbol. The runic symbol was used on the insignia of SS Division “Princ Eugen”, which committed many war crimes on the territory of former Yugoslavia. 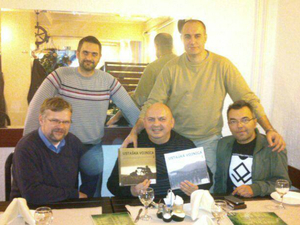 In the photo, which was taken in 2013, Dimitrijevic is sitting with the author of the book “Ustaska Vojnica” (“Ustashe Militia”). Dimitrijevic is known for being close with the right-wing former Croatian minister of culture, Zlatko Hasanbegovic, who gave him funds from the Ministry budget to publish three books. 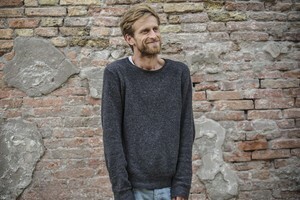 One of Kosovo’s most prominent artists, Petrit Halilaj, has been awarded with a special mention at the 57th International Art Exhibition of Venice Biennale - one of the most prestigious art events in the world - which opened on Saturday. The Party of Democratic Progress, the Serbian Democratic Party and the National Democratic Movement in Bosnia and Herzegovina filed an initiative on Monday calling for vote of no confidence against the government of the country’s Serb-dominated entity, Republika Srpska. The proposal for the vote was submitted to the President of the National Assembly, Nedeljko Cubrilovic, on Monday morning with a request for the document to be included on the agenda of the parliament's session. Bulgaria’s Vice-President, Iliyana Yotova, visited the predominantly ethnic-Bulgarian populated town of Bosilegrad in eastern Serbia on Monday for the 100th anniversary of the burning of the town and nearby villages by Serbian paramilitary during the First World War. is little known in Bulgaria and contested in Serbia. The once stagnant and monotonous political scene in Bosnia’s Serb-dominated entity is now in a state of unusual turmoil, which could lead to major changes. Read more. Serbian bookmakers have issued their first forecasts of Serbia's likely next Prime Minister, giving the best odds to the head of the Socialist Party, Ivica Dacic, who has been PM before. Read more. As intellectuals petition for Darwin’s theory of evolution to be excluded from schools, experts warn of a more general resurgence of right-wing thinking in Serbia. Read more. Deputy Assistant US Secretary of State Hoyt Brian Yee's arrival in Albania on Monday has opened the path for new negotiations between the ruling and opposition parties which may result in the postponement of the election day, which has been scheduled for June 18 but which the opposition is refusing to take part in. Media in Albania's capital, Tirana, are reporting that a series of meetings are expected to happen between Prime Minister Edi Rama and leader of the opposition, Lulzim Basha, with the intention of reaching a new agreement that will mean both sides participate in the polls. The Coalition for RECOM announced on Tuesday it will gather 50,000 signatures in support of establishing a regional commission to establish facts about the 1990s wars, and will send them to the summit of Western Balkans leaders that will be held in Trieste on July 12. Founder of Serbia’s Humanitarian Law Centre, Natasa Kandic, said that she will ask the EU to put pressure on regional governments to dedicate themselves to solving war crimes. 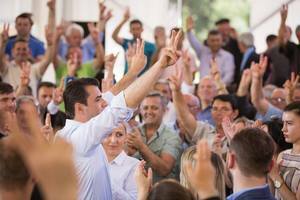 The Coalition recently relaunched its campaign for the creation of the regional commission across the Balkans. Twenty-seven migrants from Syria and Iraq, suspected of illegally entering Romania, from where they planned to go to Western Europe, have been detained by the Romanian Border Police on Tuesday. In a statement, the border police said that the migrants will be questioned on suspicion of illegally crossing into Romania from Serbia, and then will be sent back to Serbia. The US embassy in Kosovo urged political parties on Tuesday not to include anyone who is tainted by corruption on their candidate lists for the Balkan country’s upcoming elections, scheduled for June 11. “It is very important for all political parties to look at the kind of people they are putting on candidate lists, and elect people that are going to inspire the youth of Kosovo and that are going to work on their first priority on behalf of Kosovo and its citizens,” US embassy spokesperson Michele Schohn told Koha Ditore. Romania’s National Anticorruption Directorate, DNA, requested a house arrest warrant on Tuesday for Orthodox Archbishop of Tomis Teodosie after he attempted to apply for European funding despite a court order that advised against it. The archbishop is on trial for embezzling EU funds and has been placed under court supervision until the Court of Appeal in the southeastern city of Constanta delivers its sentence. While the National Assembly of Republika Srpska, Bosnia’s Serb-dominated entity, commenced a discussion over the RS government’s decision to sell the Ljubija iron-ore mine to Israeli Investment Group, four workers for the mine started a hunger strike in front of the Assembly building in protest against the sale. The protesters, who refuse to speak to the media until they find out what the destiny of the mine will be, are currently talking to the Speaker of the National Assembly, Nedeljko Cubrilovic. Bulgaria’s candidate for the role of EU Commissioner, Mariya Gabriel, will be given the digital economy and society portfolio after an interview with European Commission President Jean-Claude Juncker earlier on Tuesday, Juncker’s office announced. 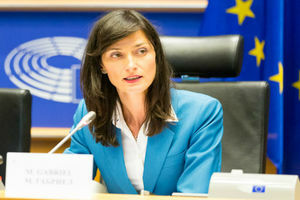 Gabriel, currently a Vice-Chair of the European People’s Party in the European Parliament, still has to pass a hearing in front of MEPs before taking the place of former European Commissioner Kristalina Georgieva, who is now CEO of the World Bank. US State Department official Hoyt Yee, who is currently touring the Balkans, said that the Macedonian President understands that he is expected to give Zoran Zaev a chance to form a government. Read the full interview. One of the opposition leaders accused of being involved in last year’s alleged plot tells BIRN that the charges against him are politically motivated and casts doubts on the prosecution’s independence. Read more. Analysts in Tirana believe that postponing the election date and changes in government are acceptable, but the opposition should pledge to implement judicial reform. Read more. Several hundred employees of the iron-ore mine operator Arcelor Mittal Prijedor arrived in Banja Luka, the administrative capital of Bosnia’s Serb-dominated entity Republika Srpska, on Wednesday ahead of the vote on the sale of the Ljubija ore mine to Israeli Investment Group, which is scheduled to take place in the RS assembly later today. According to local media, some of the workers had planned to arrive in Banja Luka with mining machines and block one of the entries into the city, as a sign of protest against the government’s decision to sell Ljubija to the Israelis, but they were stopped by police short of Banja Luka. The head of Macedonia's Social Democrats, Zoran Zaev, can now formally launch talks on the formation of a new government after Macedonia's President, Gjorge Ivanov, awarded him the mandate to do so at a ceremony in Skopje at noon. Ivanov has been withholding the mandate from Zaev since early March, when the Democrats' leader managed to muster a majority in parliament following the December 11 elections, thanks to the support of the main ethnic Albanian parties. Bulgaria’s ruling parties – GERB and the United Patriots – have decided to withdraw their support from legal changes to the agricultural lands act which would have allowed for loosening the restrictions for construction at the Bulgarian seaside, Minister of Agriculture, Desislava Taneva, said at a press briefing on Wednesday. The controversial legal amendments, which were approved by the Agriculture Committee of the parliament last week and were set for plenary vote on Thursday, sparked protest by citizens and environmental groups, staged in front of the National Assembly on Tuesday. The EU foreign policy chief Federica Mogherini and Commissioner Johannes Hahn welcomed on Wednesday Macedonian President Gjorge Ivanov’s decision to give the mandate to form a new government in Macedonia to Social Democrats leader Zoran Zaev. "We hope that this constructive spirit will continue to prevail so that the country can finally come out of the political crisis," they said in a joint statement. The US embassy in Skopje has welcomed the news that Macedonian President Gjorge Ivanov has given Social Democrats’ leader Zoran Zaev the mandate to form a new government. 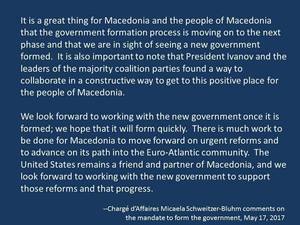 "It is a great thing for Macedonia and the people of Macedonia that the government formation process is moving on to the next phase," said the Deputy Chief of the Mission at the US Embassy, Micaela Schweitzer-Bluhm. Macedonia's former ruling VMRO-DPMNE party will vigilantly follow the work of the Social Democrats’ leader Zoran Zaev, who today received the mandate from President Gjorge Ivanov to form the new government, the outgoing party said at a press conference. VMRO-DPMNE, which had blocked the transfer of power to the Social Democrats after the December elections, insisted that their "efforts for protection of the state and national interests have bared fruit," which is seen in the fact that Zaev, whom they accused of betraying national interests, has now pledged to President Gjorge Ivanov that he would protect them. 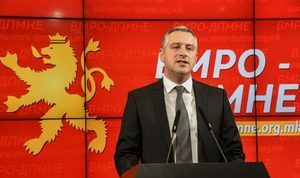 "VMRO DPNNE's political resistance and the 80 days-long protest, the longest and the most massive protests of hundreds of thousands of citizens across the country, have resulted in the necessary guarantees that the unitary character of multi-ethnic Macedonia won't be harmed," Nikola Todorov, a member of VMRO DPMNE's executive committee, said while also praising Ivanov for playing a key role in the protection of the country. Green Home, an environmental NGO in Montenegro, submitted a complaint to the Administrative Court of Montenegro on Friday requesting for the environmental approval to be revoked for the controversial Pljevlja II coal power plant, which the government wants built, Bankwatch, an EU-supported network of environmental groups, reported on Tuesday. The approval, which the Environmental Protection Agency issued on February 22, “failed to include several elements stipulated by the Law on Environmental Impact Assessment, such as a justification for the decision, responses to comments provided during the public consultation, and a list of measures to address environmental damage during the construction and operation of the plant,” Bankwatch wrote. The Montenegrin capital’s plan to honour Duke Mirko Petrovic, father of the last Montenegrin king Nikola, is provoking Serbs in the country and adding new fuel to old fires. Read more. As the leaders of both Kosovo and Serbia game the West - by feigning a commitment to the EU Dialogue that neither intends to honour – it is time the West came up with a master plan. Read more. People in four villages have asked a court in Tirana to nullify decisions allowing the construction of power plants that they say will wreck the environment of the Valbona River. Read more. 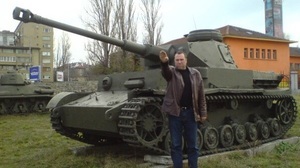 Bulgarian Prime Minister Boyko Borissov has sacked Ivo Antonov, a defence ministry expert, over a photo of him giving a Nazi salute in front of a German tank that circulated in the media three years ago - and prevented him from becoming defence minister in 2014, Tsvetan Tsvetanov, vice president of Borissov's party, GERB, announced on Thursday. The news comes after Romania’s deputy regional development minister, Pavel Tenev, resigned on Wednesday amidst controversy after media got hold of a photo of him also giving a Nazi salute. Serbian Prime Minister Aleksandar Vucic said on Thursday that he does not mind the „insult“ from Macedonia’s PM-designate, Zoran Zaev, who recently said that Serbia’s leadership is nationalistic. Vucic said that Zaev „would not like it“ if he spoke his mind about him. Social Democratic leader Zoran Zaev, who received the mandate to form a new government, yesterday said he feels „uncomfortable“ with the way Serbian leader Aleksandar Vucic has talked about his country, but is willing to improve relations. Serbian Prime Minister Aleksandar Vucic said on Thursday that it would be “humiliating for the EU” if Kosovo’s representative in the EU-sponsored negotiations with Belgrade was Ramush Haradinaj, candidate for the post of PM in the upcoming Kosovo elections. Asked about the possibility of Haradinaj becoming Prime Minister, which would place him in charge of representing his country in talks with Serbia, Vucic said that the dialogue in Brussels would continue none the less. An assault on democratic norms in the Balkans should be treated with the same urgency as such a crisis would precipitate within the core of the EU. Read more. In a political breakthough, Prime Minister Edi Rama and opposition leader Lulzim Basha have agreed to delay the elections for a week, and on representation of opposition ministers in the cabinet and key institutions. Read more. Only a dozen workers remain in the Dolac match factory, Bosnia’s last, which has been churning out matches using a secret recipe since the days of the Emperor Franz Joseph. Read the full story. Serbia’s chief diplomat Ivica Dacic said that the foreign ministry will „react“ to the statement of the US ambassador in Belgrade, Kyle Scott, who called the pro-government tabloid Informer „trash“. „This is unnacceptable. Nobody has the right to treat journalists like that, especially not foreign diplomats,“ Dacic said on Thursday evening. Mayor of Belgrade Sinisa Mali said that he „didn’t find his way“ as a politician, and did not know how to answer the „nonsensical campaigns“ against him in the media. Mali’s tenure of office, which should be ending prematurely this summer, was plagued with scandals, such as the controversial night–time demolitions in the Savamala district. Journalists from Serbian investigative network KRIK have asked people to donate money to them so they can publish their story about Belgrade Mayor Sinisa Mali as an ad in Politika daily after Politika published a PR text about Mali’s achievements. 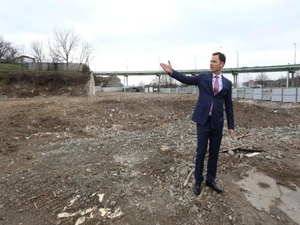 Mali, who has been Belgrade’s mayor since 2014 and whose tenure has included much controversy – namely over his alleged involvement in the Savamala demolitions in April 2016, announced that he will not run for re-election. 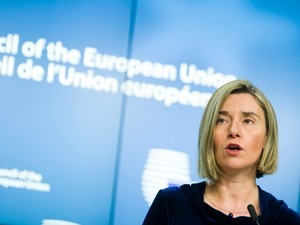 EU High Representative for Foreign Affairs and Security Policy, Federica Mogherini, called the prime ministers of six Balkan countries to join her for an informal meeting in Brussels on May 24. „The call was issued in order to talk about the regional situation, in light of recent events, and determine further steps,“ the European Commission spokesperson Maja Kocijancic told Beta news agency. The region recently saw tensions increase between Serbia, Albania, and Kosovo, as well as in Macedonia due to the political crisis after the elections. The meeting will be attended by the prime ministers of Albania, Bosnia and Herzegovina, Montenegro, Macedonia and Serbia. In a joint letter on Friday, the High Representative of the EU for Foreign Affairs, Federica Mogherini, and the EU Enlargement Commissioner, Johannes Hahn, hailed the deal reached between the two main political parties in Albania on Thursday. "The political leaders have responded to their citizens' expectations and showed democratic maturity… Now, this agreement must be swiftly implemented to prepare elections in line with international standards," the letter says, also congratulating the parties on their pledge to vote on the parliamentary bodies that will vet Albanian judges and prosecutors. Nine days after its official inauguration in the presence of EU Ambassador to Bulgaria Eric Rubin, the monument of former US President Ronald Reagan in Sofia’s South Park was vandalised on Thursday night, making it the latest in a series of such incidents in Bulgaria. Eyewitnesses posted pictures of the monument, which has been splashed with white paint, foam and wrapped up with red cloth, covering Reagan’s face. 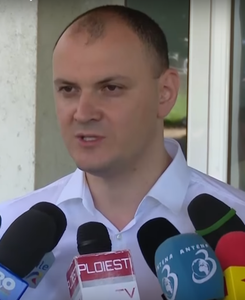 Romanian tycoon and former MP Sebastian Ghita opposed his extradition to Romania at Friday's court hearing, claiming that his case is political persecution. His attorney asked for Ghita’s extradition to be cancelled and for him to be placed under house arrest instead, which the Serbian Higher Court will decide on in later hearings. Hungarian low-budget airliner “Wizz Air” is introducing four new lines from Belgrade this week – three to Friedrichshafen, Nuremberg and Hannover in Germany, and one to Malta, the company announced on Friday. The company will organise two flights per week on each of the new lines. “Wizz Air” currently operates 20 lines to seven countries from airports in Belgrade and Nis. Several hundred citizens of Serbia’s southern town of Cajetina protested in Belgrade on Friday because their municipality was not issued a permit for the construction of a ropeway. Mayor of Cajetina Milan Stamatovic told journalists that the people have gathered to fight “political discrimination” coming from the ruling Progressive Party. 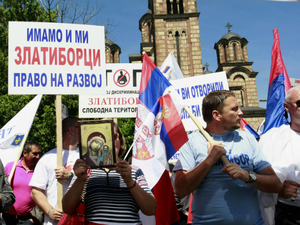 The protest was supported by the leader of the right-wing Dveri movement, Bosko Obradovic.